Oppo Neo 7 Gets Another Price cut, Down To 5990 Pesos! Home / mobile / news / oppo / Oppo Neo 7 Gets Another Price cut, Down To 5990 Pesos! After dropping its price more than half a year ago, Oppo Philippines has announced that they're dropping the price of the Neo 7 once more. From 7,490 Pesos, it is now available for 5,990 Pesos. In case you missed it, the Oppo Neo 7 is a sleek handset with comfortable to hold rounded edges and thin yet durable mirror-like back cover. It's equipped with a 5 inch TFT qHD screen, 64 Bit Snapdragon 410 CPU, 1 GB RAM, 16 GB expandable to 128 GB storage, and 2,420 mAh of battery. The handset also boast a good type of 8 MP main camera w/ f/2.0 aperture for your basic mobile photography needs. In front, there's a 5 MP f/2.4 w/ beautify mode for selfie. It also has LTE, GPS, and dual SIM card slots. 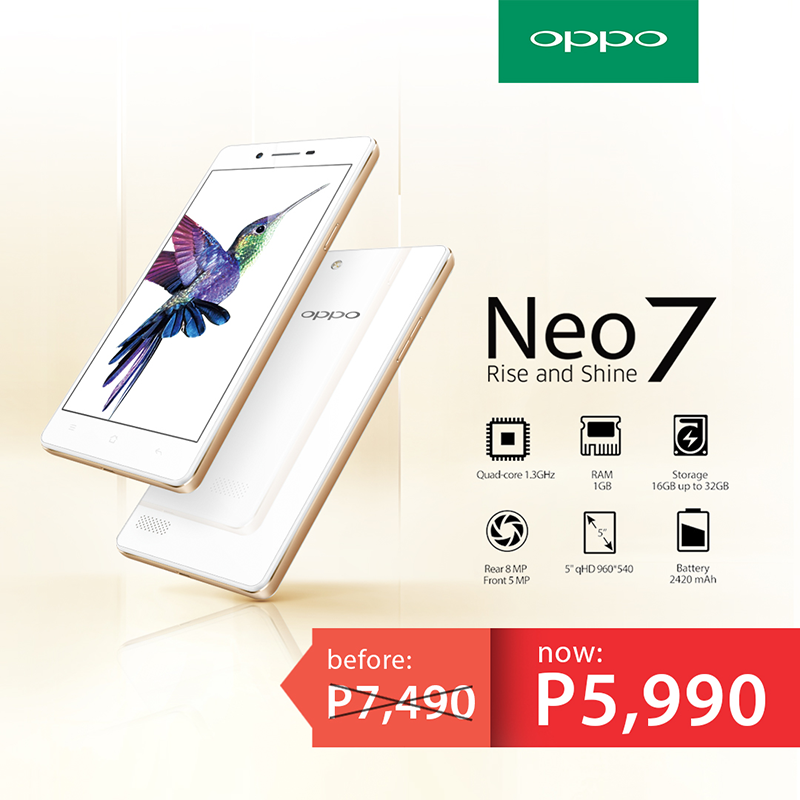 The discounted Oppo Neo 7 is now available in all Oppo concept stores and dealers nationwide.